The oil and gas company Blue Energy Limited has entered into an agreement for exploration in an area roughly the size of England, north-west of Tennant Creek (see map). Chairman John Ellice-Flint says the company will be exploring for “conventional and unconventional oil and gas”, the former appearing in sandstone and limestone, the latter in shale. The controversial fracking is sometimes used to recover unconventional oil but Mr Ellice-Flint says horizontal drilling will be the preferred method. Only exploration, which will take four years and employ 15 to 20 people during the seismic acquisition phase, will determine what form of exploration well will be drilled. Mr Ellice-Flint is the former CEO and Managing Director of Santos which operates the Mereenie and Palm Valley fields west of Alice Springs, and has recently announced new exploration activity. He says the industry’s “rejuvenation” can be attributed to the current NT Government being “proactive and very interested in growing the hydrocarbon industry”. He says the Central Land Council, too, has been “proactive and co-operative” during his time with Santos. The new ventures are benefiting from new technology, allowing gas and oil production from fields previously thought to be uneconomic. The new initiative “positions the company ideally to take advantage of the high demand by global energy players for unconventional hydrocarbon acreage. “The relatively shallow nature of the potential marine Cambrian source rock sequence in the Wiso Basin, suggests that it would still be in the liquids maturation window and thus not a high cost deep drilling target as other shale targets elsewhere in the world can be,” says Mr Ellice-Flint in a report to the Stock Exchange. 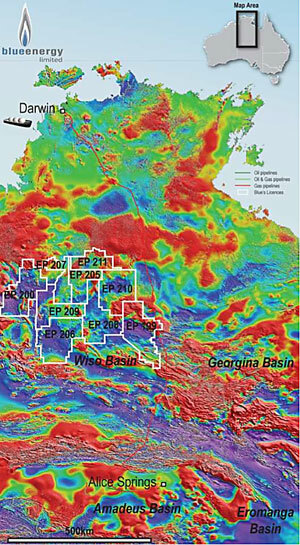 “Significantly, we note the widening attention and interest the Northern Territory sedimentary basins are receiving from domestic and international oil companies. “Statoil, Santos, Central Petroleum, Total, Pangaea and Armour Energy are among a list of companies with adjacent active acreage to Blue Energy’s new Wiso Basin permits. The image is a Total Magnetic Intensity Map Northern Territory. No matter how enthusiastic some oil industry companies are about locating oil and gas in the NT any discoveries are not good news. The exploitation of these resources means more CO2 in the atmosphere and the continuing warming of the globe. By concentrating on renewable energy we can be confident we are not polluting our environment. From my observation there is plenty of sun in the centre and we don’t have to frack or drill to catch it. At this point it is helpful to have a mechanism, “carbon trading” to encourage renewable energy development but if the price of renewables continues to decline it will become more competitive with carbon energy sources and the “carbon price” would reduce. In my view it will be a matter of how quickly the cost of renewable energy declines and how fast we want to reduce carbon emissions that will determine the short term “carbon price”. Predictions however that the price of carbon will march inexorably upward are simply scaremongering designed to delay taking the first essential steps. Australia has now taken the firsts steps and should now stay the course. I suggest everyone reads the National Geographic March 2013. This is an article that covers all sectors of this debate. As you may know Bush and Cheney changed the rule in favour of the Oil industry, known as “The Halliburton Loophole” where they did not have to declare what chemicals were being used for Fracking. I only hope that Australia stands firm and will not allow the same freedom allowing unknown chemicals being used. Even now in parts of Colorado, people are having second thoughts. Permits having been granted are now being stopped until further research is carried out. The following link is to a very interesting article about fracking in the US and the lengths the energy companies are going to to suppress public knowledge of and debate on this highly contentious mining method. The message seems to be, don’t trust them anywhere near your water. In a local context I would include in ‘them’ the governments in Darwin and Canberra, local and international mining companies, and the CLC. This significant and wider attention coming from domestic and international oil companies does not appear to have been deterred by the prospect of any future resources tax (MRRT) on oil and/or other minerals. The last paragraph says it all, particularly these remarks “especially given Australia’s favourable fiscal regime”. Political stability and low sovereign risk could be added to this article along with the rejuvenation that can be attributed to the current NT Government being proactive and very interested in growing the hydrocarbon industry; and the fact that the Central Land Council, too, has been “proactive and co-operative” during Mr Ellice-Flint’s time with Santos. Fortunately most business people appear to be a little more positive than some of our potential politicians. I’m sure we all hope that whatever these companies do in the future in no way contaminates or pollutes any of the groundwater’s or aquifers in the planned exploration areas.